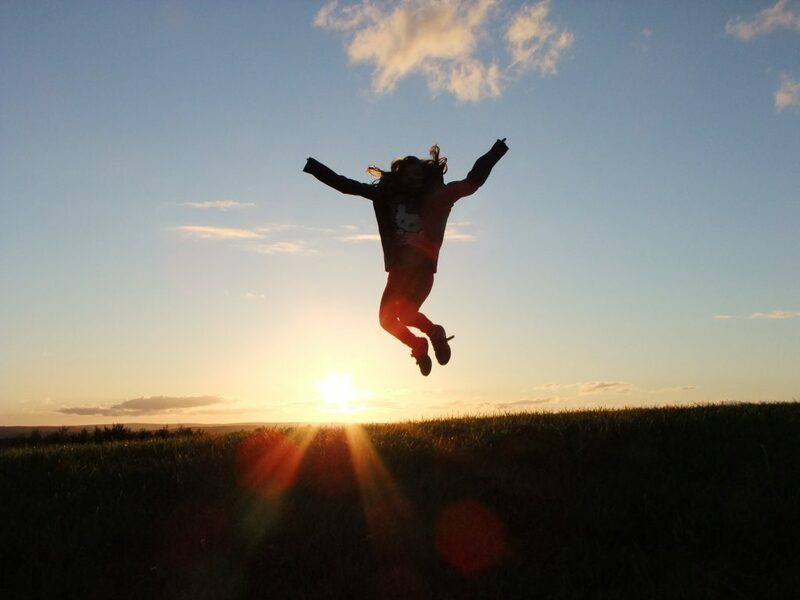 Do you struggle with an inner critic? Are you hiding a big piece of who you are? I want you to know you do NOT need to keep living this way. Imagine feeling comfortable being yourself – to know that you are good enough just as you are. Imagine what it would be like to really embrace YOU and everything that means! IMAGINE being FREE to do the things that bring YOU JOY! THINK of experiencing PEACE with every part of YOURSELF. FEEL the difference of ACCEPTING and EMBRACING YOU! 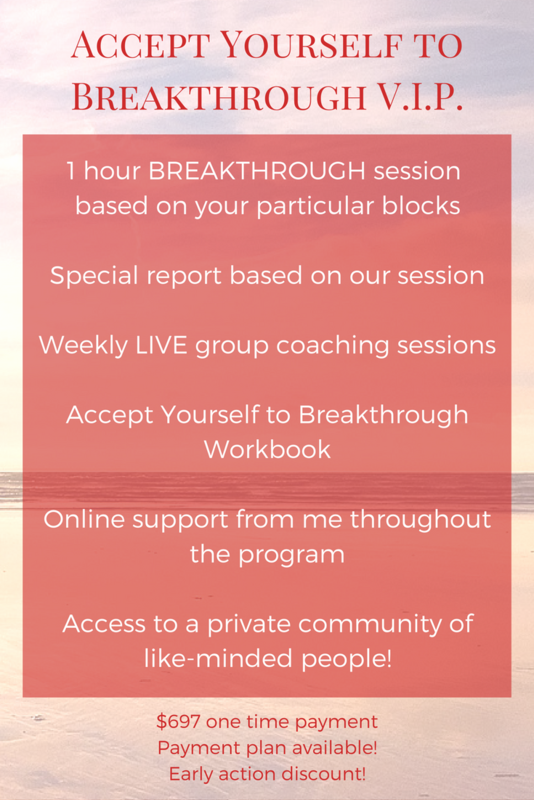 The Accept Yourself to Breakthrough Program can help you! I have a 100% breakthrough rate with my 1-on-1 clients and I want you to get access to this magic! 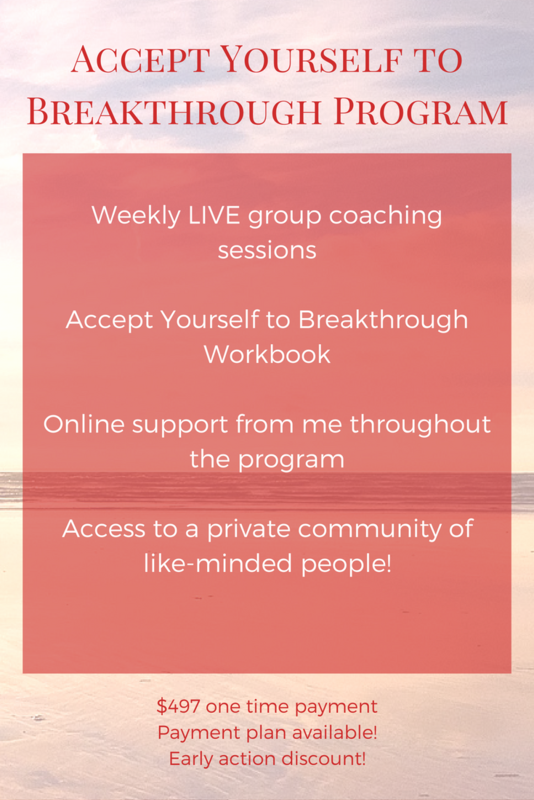 This 6 week group coaching program is a UNIQUE opportunity to work with me for a fraction of the cost while getting access to a group of like-minded people supporting and encouraging you on your acceptance journey! Acceptance is not a one and done kind of thing – it’s like the dishes. You’ve got to do it EVERY DAY. This is because you change. Even if you accepted something about who you USED to be, you will grow into a new person and need to accept new things about yourself. For this reason, you need to have a solid acceptance practice in place that you will do CONSISTENTLY. CHANGING your experience NOW to feel GOOD! EMBRACING YOU and celebrating who YOU are! PLUS special focus techniques on problem areas TAILORED to the group! The techniques I will share are the same ones I use with my clients that lead to AMAZING BREAKTHROUGHS! for a fraction of what it costs to do 1-on-1 coaching! In this 6 week program starting January 1, 2018 you will have the opportunity to have access to all my BEST strategies and practices as I guide you through how to use them to live your best life! Space is limited however - I can only take 30 students for the regular program and these seats will go fast! But what if you want EVEN MORE? That's why I created the V.I.P. option where you will get a 1 hour 1-on-1 session with me and special report based on our work together at a FRACTION of what it would cost to hire me as your personal coach. There is something magical about personalized attention, and I wanted to give you the opportunity for your own! These spots are EXTREMELY limited because I can only do so many personalized sessions. If you have ANY interest in this, get your spot. This is the FIRST TIME this program is being offered! It will never be this low priced again and spots are limited! Grab the introductory price PLUS the early action discount of $150 (reflected in the current price below) available 11/20 through 11/26! Those who purchase BY FRIDAY will gain a special SURPRISE BONUS! There's no reason to NOT start 2018 right. You deserve this. You are worth it! 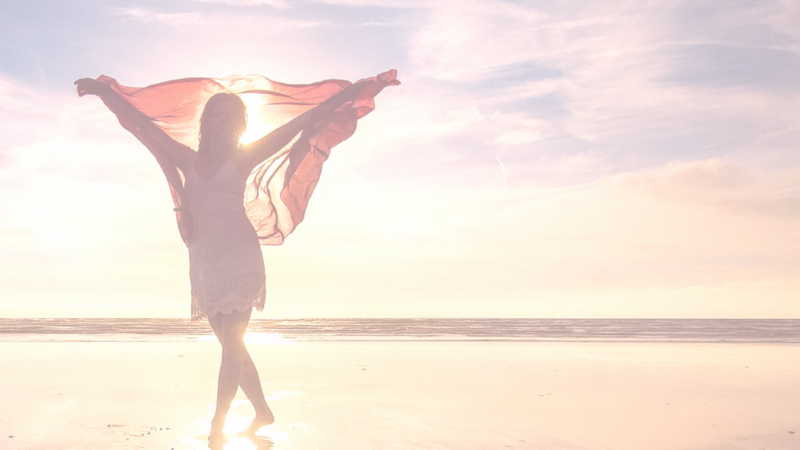 Let's bring more love, peace, joy and freedom to your life by helping you EMBRACE YOU!